Photo: © Italian Coastguard/Massimo Sestini. The international community is experiencing a dramatic shift in the situation facing the world’s refugees as a global surge in war, conflict and persecution has caused a record number of people to flee their homes in search of safety, the United Nations refugee agency reported yesterday, ahead of World Refugee Day on 20 June. According to data gathered by Office of the UN High Commissioner for Refugees (UNHCR) over the course of 2014, the number of people forcibly displaced during the reporting year swelled to a staggering 59.5 million people compared to the 51.2 million from the previous year. The figures, collected by the UN agency for its latest Global Trends: World at War, suggest that one in every 122 humans is now either a refugee, internally displaced, or seeking asylum. 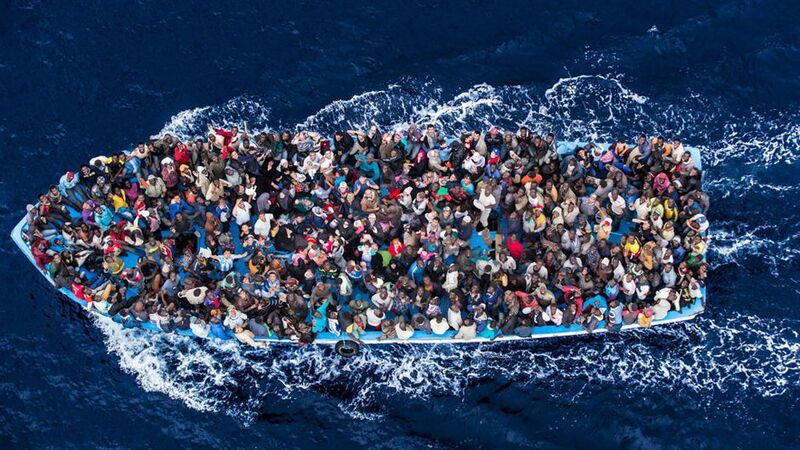 If this were the population of a country, says UNHCR, it would be the world’s 24th largest. “We are witnessing a paradigm change, an unchecked slide into an era in which the scale of global forced displacement as well as the response required is now clearly dwarfing anything seen before,” UN High Commissioner for Refugees António Guterres declared in a press release marking the report’s release. For an age of unprecedented mass displacement, we need an unprecedented humanitarian response and a renewed global commitment to tolerance and protection for people fleeing conflict and persecution. “It is terrifying that on the one hand there is more and more impunity for those starting conflicts, and on the other there is seeming utter inability of the international community to work together to stop wars and build and preserve peace,” he added. In a detailed analysis exploring the range of conflicts that have given rise to the current mass diaspora of refugees, the UNHCR report notes that in the past five years, at least 15 conflicts have erupted or reignited. In Africa, the outbursts of hostilities, many of which are sectarian in nature, have consumed eight countries, including Côte d’Ivoire, the Central African Republic, Libya, Mali, northeastern Nigeria, the Democratic Republic of the Congo, South Sudan and, more recently, Burundi. In the Middle East, Syria, Iraq and Yemen remain ablaze while, in Europe, Ukraine has spawned a displacement crisis subsuming more than more than 1.3 million people, mostly across the country’s eastern provinces of Dinetsk, Luhansk, and Kharkivska. In Asia, meanwhile, the unresolved tensions in Kyrgyzstan and in several areas of Myanmar and Pakistan, continue to force people across the countries’ borders. The plethora of crises and conflicts, observes the UN study, has also provoked a dangerous and worsening trend in irregular migration as millions of refugees around the world are pushed into an uncomfortable and deadly dynamic with human traffickers and smugglers as they seek passage to safety. 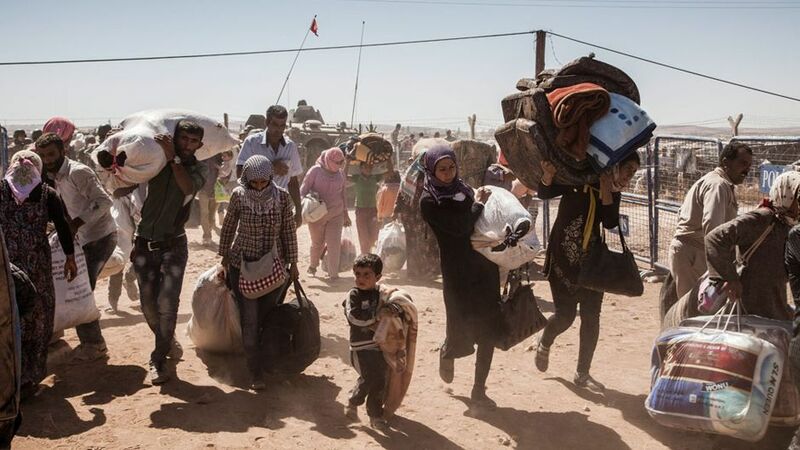 Syrian Kurdish refugees cross into Turkey from Syria, near the town of Kobani. 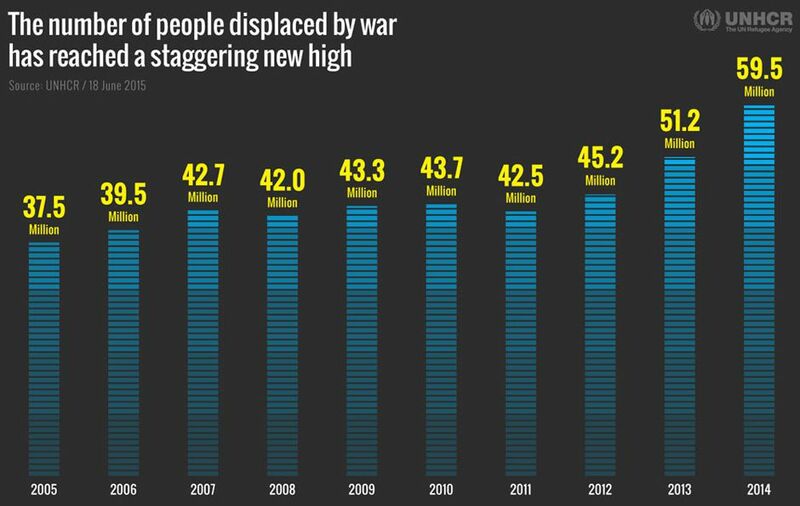 The war that erupted in Syria in 2011 has propelled it into becoming the world’s single largest driver of displacement. Photo: © UNHCR/I.Prickett. Sea crossings from the Middle East and North Africa to Europe have surged with the most recent official figures showing that as of 8 June a total of 103,000 refugees and migrants had arrived in Europe: 54,000 in Italy, 48,000 in Greece, 91 on Malta and 920 in Spain. This includes record numbers of refugees landing daily in the Greek islands. Meanwhile, the overall forced displacement numbers in Europe for the 2014 reporting period totalled an overwhelming 6.7 million. Half way around the world, the refugee situation in Asia is equally tragic. In its report, UNHCR explains that Asia has long been one of the world’s major displacement producing regions and, in 2014, the numbers of internally displaced across the continent grew by 31 per cent to 9 million people. The ongoing plight of the Rohingya from Myanmar’s Rakhine state and in the Kachin and Northern Shan regions has similarly produced a maritime refugee crisis. Copyright UN News Centre. All rights reserved. The UN News Centre provides breaking news, features, multimedia, meetings coverage and many more resources related to the United Nations. What Would it Mean to End Statelessness by 2024?